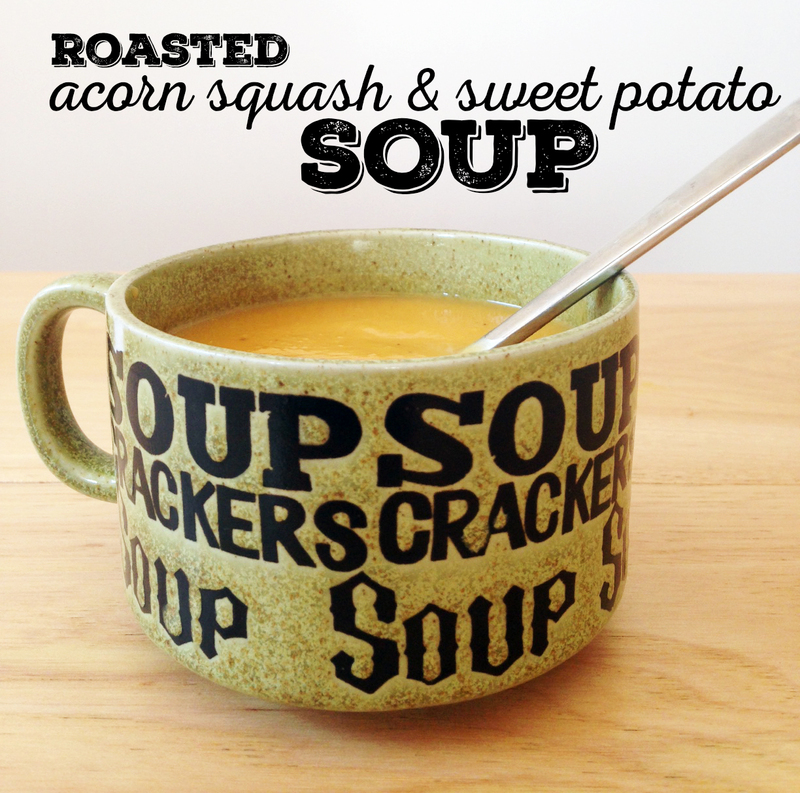 roasted acorn squash & sweet potato soup. It got really cold really quick here and I’ve been on a big soup kick! This is a really easy and delicious soup I found here, and once you roast your squash and potatoes it comes together in no time! Preheat oven to 400 degrees. Slice the acorn squash in half (lengthwise) and remove the seeds and guts–place cut side up on a large baking sheet, drizzle with 1-2 tablespoons of olive oil and season with salt and pepper. Slice the sweet potatoes in half lengthwise, drizzle and rub the cut side with olive oil and season with salt and pepper. Place cut side down on the baking sheet along with the acorn squash. Roast for 45 minutes to an hour, or until both the potato and acorn squash are fork tender and very soft. Remove from oven and when cool enough to handle, remove the squash from the skin and set aside in a large bowl. Discard the skin. Meanwhile, heat the remaining tablespoon of olive oil in medium-sized soup pot. Add the onion and saute over low heat until soft and completely translucent. Add the ground ginger and garam masala and cook for an additional minute or two, stirring constantly, until fragrant. Add the vegetable broth, roasted squash, and sweet potato. Bring to low simmer, cover, and cook for an additional for 10-15 minutes. Puree in a blender (in batches, if necessary) and return to heat. Add the coconut milk and stir until well combined. Season with salt and pepper to taste.